What started as a trickle of oil-pipeline protesters two months ago has spilled into a massive anti-Kinder-Morgan movement on Burnaby Mountain, if Monday night's crowd is any indication. 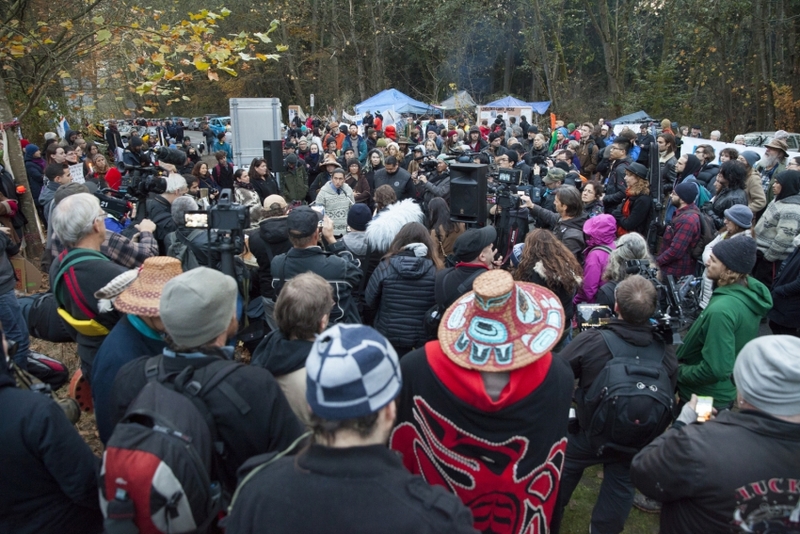 More than 800 people showed up at 4pm – the exact time a B.C.-Supreme-Court-ordered-Kinder-Morgan injunction took effect. It is now illegal for protesters to interfere with the company’s controversial pipeline survey work for the Trans Mountain pipeline expansion. The RCMP were everywhere, but neither they nor the court order seemed to stop the crowds from expressing their anger at the project. Youth, seniors, native, non-native all showed up in force. More notably, First Nations leaders led the fiery speeches. “And that’s why we’re suing em’!” said George, to roaring applause. Kinder Morgan protest on Burnaby Mountain, post-injunction, on Monday night. Photo by Mychaylo Prystupa. Those attending to the conservation park on the mountain lately have seldom seen a larger crowd. Live TV crews, satellite trucks, photographers and film-makers were everywhere. Helicopters and planes buzzed overhead. A drone was seen, too. “Our actions of what we do, are for everybody," continued George. "The reason why we as a nation step forward, because of this flawed process of the National Energy Board, who are allies with these pipelines… [Prime Minister] Harper is looking out for his buddies," he yelled. Texas-based Kinder Morgan was asked to comment on this story Monday evening. We will update this article when they respond. The company is attempting to do geo-technical work required by the NEB for the board to consider a proposed re-routing of the pipeline under the mountain, to avoid homes and streets. But both the company and the NEB are now facing several legal attacks. Enviro groups and First Nations state the board's requirement that hearing participants be "directly affected" is unconstitutional, because it denies those who wish to speak up about climate change for example. The troubles for the pipeline on the mountain first heated up this summer. That's when the City of Burnaby and its mayor said the project was trespassing municipal lands. Legal battles ensued, culminating in a order from the National Energy Board to allow the survey work to proceed. But protester clashes with the company's crews in late October seemed to drive wider public interest. SFU professor Lynne Quarmby at Kinder Morgan protest on Burnaby Mountain, post-injunction on Monday night. Photo by Mychaylo Prystupa. The company filed an injunction and civil suit against two SFU professors, an administrative worker, a retiree and a young activist. Public reaction, on theVancouver Observer website for example, has been overwhelming. A story about the social media hashtag "#KMFace" - a mocking of the company's claim that protesters' facial snarls were a form of "assault" -- garnered so much traffic it nearly crashed the server. Simon Fraser University biochemistry professor Lynne Quarmby is one of those sued by the company. She attended tonight's rally. "I think it's amazing! I think it's empowering. It gives me strength to be brave," said Quarmby at the edge of the crowd, Monday night. Kinder Morgan protesters on Burnaby Mountain after the company's injunction took effect, Monday evening. Photo by Mychaylo Prystupa. Many in the protest movement wondered if people would respond tonight. After all, Quarmby and her co-defendants now face serious legal troubles, not to mention legal bills. But with the size of the crowd, it is becoming clear the company is facing a serious public relations issue for its $5.4-billion pipeline. The project seeks to pump 890,000 barrels per day of oil sands bitumen from Edmonton to Burnaby, and onward to Pacific markets via 400+ massive super tankers per year out the Port of Vancouver. Musqueam leader Audrey Siegel at the Kinder Morgan protest on Burnaby Mountain on Monday night. Photo by Mychaylo Prystupa. Musqueam leader Audrey Siegel thanked everyone who came - Aboriginal and non-Aboriginal, before leading a "women's warrior song." "There will be no pipelines…. No tankers… no fracking.. because we don’t want your dirty oil!" “Keep using your voices. Keep standing strong. Bring more people out here every time. Educate people on the truth,” said Siegel, to loud applause. RCMP told the crowd they did not intend on arresting anyone, and had not by the time of publication. The City of Burnaby is appealing the court's order enabling the survey work in the B.C. Supreme Court on Wednesday. Newly re-lected Burnaby Mayor Derek Corrigan thanked citizens for their "courage" but cautioned them against breaking the law. He asked people to "have faith" in the city's legal battle against the pipeline company, saying "we are in for the long haul." Corrigan added that he was fighting for cities all across Canada contending with unwanted oil pipelines. The City also filed an appeal in a federal court challenging the National Energy Board's order permitting the survey work. Last week, Kinder Morgan Canada president was asked by a reporter if he worried the Burnaby Mountain situation could spiral into a "Clayoquot Sound" type situation - a logging protest in the 1990s that caught worldwide attention when 800 protesters were arrested. “I most definitely have those thoughts," confided Ian Anderson.